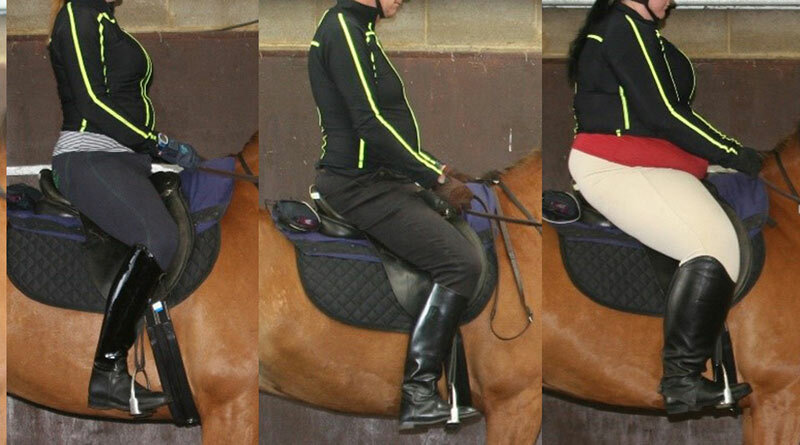 Lateral images of the four riders, from left to right, Light (L), Moderate (M), Heavy (H) and Very Heavy (VH) stationary on Horse 2. The seat of the saddle is of correct length for riders L and M, is short for rider H, who is sitting on the back of the cantle, and is very short for rider VH, whose seat extends beyond the cantle. There is lack of vertical alignment of the shoulder, tuber coxae (‘hip’) and heel for riders H and VH. Heavier riders should ensure they have a horse or pony of the appropriate size and fitness to ensure they can cope with the weight, the findings of British research show. Researchers have delved into what is a sensitive area for some riders, carrying out research to assess gait and behavioural responses of horses to riders of similar ability, but different bodyweights. The findings, published in the journal Equine Veterinary Education, show the importance of an appropriate rider weight to ensure the wellbeing of the horse. Dr Sue Dyson, who led the study, said the findings showed not only the importance of a good rider-weight ratio – especially for heavier riders – but also that the saddle should correctly fit both horse and rider. Dyson, who is head of clinical orthopaedics at the Animal Health Trust’s Centre for Equine Studies, set out with her colleagues to conduct a pilot study using six sound horses in regular work. They were ridden by each of four riders of different weights: Light (60.8kg), moderate (77.8kg), heavy (91kg) and very heavy (142.1kg). The riders’ body mass indexes were 23.2, 28.0, 26.3, 46.9 respectively. The light rider represented 10.0% to 11.7% of the weight of the horses she rode, the moderate rider 12.8 to 15.0%, the heavy rider 15.3 to 17.9%, and the very heavy rider 23.6 to 27.5%. Saddle fit was assessed subjectively throughout the study. Each horse was ridden twice by the riders of light and moderate weight, and once by the heavy rider. The very heavy rider rode five of the horses once and one of the horses twice. Each horse‐rider combination undertook a standard 30‐minute dressage-style routine. Each test was abandoned if the researchers observed lameness in the horse graded as three or more on an eight-point scale in one limb, grade two or more in two limbs, or if the animal showed 10 or more of 24 recognised behavioural markers of pain. Horses were reassessed in-hand 45 to 60 minutes after any abandonment to assess their state. Dyson and her colleagues reported that all of the 13 dressage-style tests performed by the heavy and very heavy riders were abandoned – 12 on the basis of lameness and one on the basis of behavioural signs of pain. Only one of the 12 rider tests performed by the rider of moderate weight was abandoned, on the basis of lameness. The light rider completed her tests without any abandonments. Lameness in the tests was confirmed using inertial measurement devices. All horses trotted sound after the test abandonments and were moving well under saddle when the study was finished, indicating that the lameness effects induced by weight were temporary. The authors concluded that large riders can induce temporary lameness and trigger behaviours consistent with musculoskeletal pain. “This may relate to rider bodyweight and/or weight distribution,” they said. The study team, discussing their findings, said they had documented a substantial temporary adverse effect of rider on gait and behaviour, with no tests being completed by the H or VH riders. The two factors most likely to underlie this finding were the rider weight as a proportion of horse weight, and the rider position in the saddle/on the horse’s back (which is a function of rider size). “The design of this pilot study does not allow us to determine which of these two factors is most influential or whether, indeed, both are important. “In terms of rider weight, our results suggest that rider BMI, per se, is not a key factor: Both the moderate and heavy riders were classified as overweight, based on BMI,” they noted. However, the rider of moderate weight completed 11 out of 12 tests, whereas the heavy rider did not complete any of their six tests. Saddle fit for the rider may affect the horse’s ability to move comfortably, they said. They said the different body proportions of the four riders suggested that a range of saddles would have been required for each horse if optimum rider saddle fit was to be maintained. “However, we deliberately elected not to use different saddles for each rider because this would have introduced another variable factor. In the study, lameness was seen in most of the horses when being ridden, which had not been apparent in hand. However, when present, lameness was usually low‐grade and transient with the lighter riders, and was deemed acceptable for continued work. The authors of the study said their results were not necessarily applicable to lower level activity, such as hacking at the walk, compared with the 30‐minute test predominantly at the trot and canter, nor to fitter animals, nor those that have been slowly adapted to weight‐carrying. The study team acknowledged some limitations. Saddle fit was not ideal in all horse‐rider combinations and the abandonment criteria were subjective. “In conclusion, we have clearly demonstrated deleterious effects of inappropriate rider size on equine gait and behaviour. “The results suggest that any adverse influence of less than ideally fitting tack for horse or rider may be accentuated by riders who are heavier and/or taller. The researchers say further work is required to determine if horse fitness, adaptation to heavier weights and better saddle fit for heavier or taller riders will increase horses’ weight‐carrying capacity. Funding for this research has been confirmed. The study was supported by World Horse Welfare, the Saddle Research Trust, Frank Dyson, the British Equestrian Federation, British Horse Society, Pony Club, Polocrosse UK, The Showing Council, The Showing Register, The Society of Master Saddlers, Riding for the Disabled, British Eventing, British Dressage, the British Horse Foundation, the Worshipful Company of Saddlers and Endurance GB. Dyson, S, Ellis, A, Guire, R, Douglas, J, Bondi, A, Harris, P.
I am a Physiotherapist and a Rider Coach. I teach Rider Biomechanics. I have many heavy riders. Yes, correct saddle fit and horse size is essential. I consistently find heavy riders tend to ride with their lower leg forward and not under their hips. (As in your photos). This puts their balance out and they tend to be left behind at all paces resulting in their seat “banging” into the saddle and hence the horses back more often than unbalanced riders. I teach lower leg stability and core strength to all riders but emphasize this with heavy riders to be centered and effective with their balance. A rider who is top heavy and weak lower is the problem and can be changed with the correct rider training. I applaud you for tackling a hot button subject. Truly it is not rocket science the results. I remember watching a poor horse in a western pleasure class literally having to rebalance itself as the wave of fat caught up at every stride…it was excruciating to watch as the horse was in obvious discomfort but did it’s job anyway. Very sad but true. We have published an article called “saddle fit and the heavier rider” and received numerous negative comments on this. I’m glad that there is now an actual research study done to support what we have said all along. Here it is in its entirety for your additional reading pleasure. Thank you for the report, a bigger saddle for the heavy weights not only extends the bar lengths but puts more pressure on the kidneys with the dead load that these people ride with. You see these heavy weights always riding a smaller horse because they can not get on a bigger horse, was on a poker rally where one used a step stool to get on, horse was under lots of stress on the hills especially going down as all the rider weight was jamming into the withers. Riders please think of your horse and get on a diet. Thanks for letting me air out some frustrations.